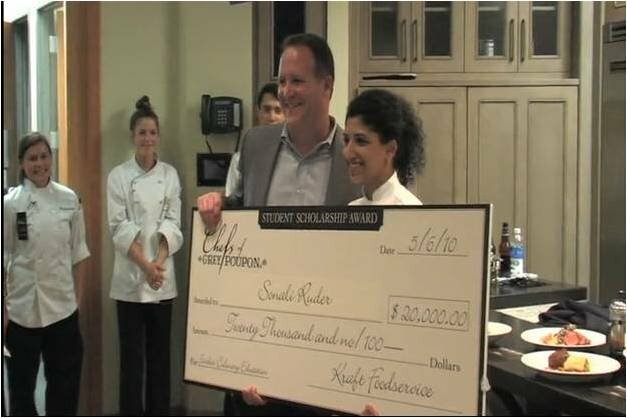 Last week I had the honor of representing my school, the Institute of Culinary Education, in the 2010 Chefs of Grey Poupon Student Culinary Competition. Earlier this year I won a preliminary contest at my school against two other students, thereby securing my spot in the main event against students from CIA, Johnson & Wales, and Kendall College. My dish was “Pan Roasted Lamb Loin with Celery Root, Apple and Dijon Puree, Mustard Greens, Grey Poupon-Glazed Baby Carrots, Pomegranate Dijon Jus and Truffle Mustard Mushroom Crisp.” Wow, that’s a mouthful! I had to use Grey Poupon in at least 50 percent of the dish, and actually I had incorporated it in all of the components. Over the last two months, I’ve had several training sessions with my coach, Chef Instructor James Briscione, working hard to perfect my dish as well as fine-tuning my techniques to make sure that I would be able to finish my dish in the alotted hour and a half time. The only thing that we couldn’t prepare for was the mystery basket challenge- the thing that scared me the most about the competition. Being the type of person who likes to over-prepare for everything, I wondered how I would do in a situation where I would just have to wing it. The evening we arrived in Chicago, the organizers of the contest held a wonderful multi-course dinner at the restaurant Aja in the Dana Hotel. The food was delicious but I couldn’t stop thinking about the big day ahead. The morning of the competition, we were taken to the Viking Cooking School, the site of the competition, in a limosine. All of the contestants and our coaches rode together and there was little conversation in the car- I think everyone was as nervous as I was. When we arrived at the school, we had some time to set up our stations in the kitchen and check our ingredients and equipment. The kitchen was very nice but space was a little tight so I worried about having enough room for all of my equipment. I knew I would have to stay very organized when I was cooking. I checked all of my ingredients making sure that everything was there and then we had several hours to kill before the competition started. And it turns out that I was randomly selected to start cooking last of the four students. Plenty of time for my nerves to reach exponential levels, although I tried not to show it! Finally, it was my time to cook. I was escorted into the kitchen where one of the contest officials greeted me. I was told that for my mystery basket dish, I would have to create either a Health and Wellness dish or a Gourmet Sandwich using at least 2 items from the mystery basket plus Grey Poupon mustard. There were 5 ingredients in the mystery basket: Miracle Whip, Planters peanuts, Barbeque sauce, pumpernickel bread, and black garlic. They also had a wide variety of pantry items we could use including several types of meat, vegetables, fruit, and other goods. I would have 2 hours and 15 minutes to create both a mystery basket dish plus my original dish and would have to plate all 8 dishes (one for each of the three judges plus one for presentation) when my time was up. I had never tasted or used black garlic before but I decided to challenge myself and use it. It actually is just fermented garlic and the cloves are black and soft with a tangy flavor that reminded me of tamarind when I tasted it. My strategy was to start my prep for my main dish, that way I could try to think of ideas for my mystery basket dish while I was chopping my vegetables without wasting too much time. As I chopped and sauteed mushrooms, my mind was racing trying to figure out what I was going to make. There were so many pantry items available, it actually made it harder to come up with an idea. I saw some kind of ground meat, probably turkey (nothing was labeled), and thought of doing a slider. I also saw a nice piece of salmon so I considered making a healthy salmon dish with a black garlic soy glaze with cold sesame noodles. But then I figured I wouldn’t have enough time or space to boil noodles, so I changed my plan. I went back to the pantry to check out the items one more time and that’s when I saw a container of crab meat hiding behind some other items. Immediately, I snatched it up and knew what I was going to make- a crab cake sandwich. I figured it would be a good way to incorporate the mystery basket ingredients plus the Grey Poupon. I just wondered if I would have enough time to make them. Although I had constructed a very precise timeline in the weeks leading up to the contest, all of that kind of flew out the window on competition day because of the addition of the mystery basket dish. I did my best to get all of my main dish items started so that I could work on the crabcake sandwich while other things were cooking. I prepped my lamb, put all of the vegetable for my puree to boil, and started cooking the greens. As I was making my mushroom crisp, I forgot to add salt to the dough, and had to re-roll it. That made me a little nervous but I redid it as quickly as I could and put in the refrigerator. Then I got to work on the crabcakes. I sauteed minced shallots with some black garlic and mixed it together with the crab meat, Miracle Whip, Grey Poupon, an egg, soy sauce, cilantro, and breadcrumbs. After coating the crabcakes in panko breadcrumbs, I shallow fried them and then put them in the oven to stay warm. I toasted slices of pumpernickel bread and made a black garlic aioli by pureeing more black garlic with mayonnaise in a blender. I knew I needed something else on the sandwich, so I made an avocado salsa with orange juice (I couldn’t find any lemons or limes), cilantro, shallots, salt, and pepper. When I tasted it, I felt like it needed a little acidity and also something crunchy for texture so I went back to the pantry. The only crunchy thing I could find was radishes so I sliced them up and added them to the salsa. And for some acid, I found a bottle of rice vinegar. When I tasted the finished product, I was happy with it. With thirty minutes remaining, I knew I had to start cooking my lamb, so I got that in the pan. As the lamb was searing, I finished cooking up my Grey Poupon-glazed baby carrots, and made a brown butter with toasted hazelnuts for my greens. I also completed my celery root and apple puree and finished it with some mustard. Once the lamb was seared, I started basting it with butter, garlic, and fresh thyme and a delicious aroma filled the air. When the lamb was cooked to medium rare, I put it on a resting rack and started reducing the pomegranate dijon sauce. Then I did a final tasting of all of the components of my dish. Happy with the flavors, I took my plates out of the oven (warm plates are key) and set up my plating station. First I assembled the crab cake sandwiches. I spread some black garlic aioli on each piece of toasted pumpernickel bread and topped it with a couple of crabcakes and some avocado radish salsa. Once I plated the sandwich, I moved on to my main dish. The woman keeping track of the time announced that I had 5 minutes remaining. I tried to stay calm as I quickly plated all of the elements of my dish. First I placed a mound of the puree in the center of the plates and topped it with some of the greens. Then I sliced my lamb and carefully fanned the slices out along the side of the other elements. I arranged a few carrots on the plate then spooned on some pomegranate dijon jus. Finally, I assembled the truffle mustard mushroom crisps and carefully propped them up against the greens. I had about a minute left, so I used it to clean my plates, removing any errant drips of sauce. I was finished when my time was announced. As I carried the completed plates over to the judges, I felt a tiny sense of relief for finishing my dishes, but a new sense of nervous anticipation filled me knowing that I would have to do a formal presentation of my dishes. After I placed the dishes in front of the judges, I launched into the speech that I had prepared. I described my thoughts on Grey Poupon mustard and explained that one of the reasons I like it so much is that besides having a unique taste, it works great as a flavor enhancer, enhancing the inherent flavor of other ingredients. I described how I used the mustard to enhance the saltiness of the lamb, the sweetness of the carrots, the bitterness of the greens, the tartness of the pomegranate jus, and the savoriness or umami of the truffle mushroom crisp. The judges seemed to like my presentation and asked a few questions about my dishes- how did I come up with the idea of the crabcake sandwich, what did I use in the mushroom crisp? After my presentation, the judges left to deliberate. That gave me some time to finally relax a little and catch up with my husband Pete and my coach Chef James, both of whom were as nervous as I was. They both thought that I had done really well, but it was still anybody’s game. When the judges came back in, they called each of us up one at a time to critique our dishes. When they finally called me up, they were all smiling and the first judge asked me how I thought I did. I responded that I thought I did well and I was happy with my dishes. He then went on to say that he thought all of my flavors were well balanced and that my flavors were spot on. He also said that they had all agreed that I had the best use of salt in my dishes out of all the contestants. The other judges made their comments, mostly very positive, with a couple of minor critiques such as the slices of pumpernickel bread being a little thick on my sandwich. One judge even made a joke about me honing my knife skills in my other profession and jokingly called me an underachiever. Overall, I was very happy with their comments but I still knew I was up against some stiff competition so I didn’t want to get my hopes up. Finally, they were ready to announce the winners. They started by announcing the fourth place winner, the contestant from CIA, then the third place winner, the student from Kendall. It was down to me and the student from Johnson & Wales. As I waited for the announcement of the grand prize winner, I could feel my heart pounding in my chest. I knew the other student had gotten a lot of positive comments on his dishes but I had as well. Finally, the emcee announced the grand prize winner… and it was me! I couldn’t believe it! I felt like I was in a dream as I shook the second place winner’s hand and walked up to the front of the room to collect my giant check. After thanking all of the judges, I stood holding my $20,000 check while everyone took pictures. After coming so close to winning in several competitions, I had finally won! After the rest of the announcements, I went over to celebrate with Pete and Chef James as I started receving emails and phone calls of congratulations from my family and everyone back at my school. It has been an amazing experience training for this competition over the past couple of months, and it is something that I will never forget. I am so happy that I was able to bring home the win not only for myself but for my school. Thank you to everyone for all of your support. Now, on to the next contest! Congratulations on your win Sonali! My name is Lilly, and I work for Black Garlic Love. Would you be interested in doing more cooking with black garlic? We'd love to work with you!